I’ll try and give the best information as possible so that if you do decide to pick up a pair of these boots that you would or wouldn’t be disappointed. 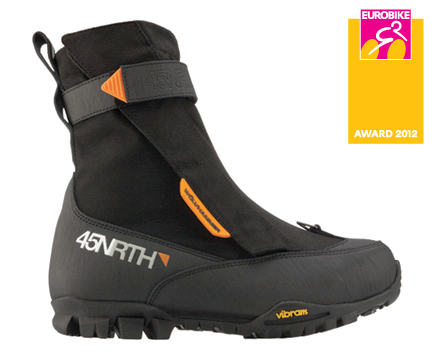 These boots are specific to winter riding, with their design, fuzzy insides and wind resistant toe etc. If you did decide to use these for summer riding your foot would be swimming in sweat that is for sure. The boot has a high top, for those instances where you decide to do an impact angel and need to stand back up in the deep snow. There is a nice ankle strap to tighten up and prevent any snow from going down inside your boot which is a really nice feature. If you do ride with Gaiters, on the toe of the boot there is a Gaiter hook for those knee deep snow banks etc. The boot is also SPD compatible which is a great feature. I’m running these boots with Crank Brothers pedals, just to allow the snow to fall through the pedal a lot easier than a Shimano or Time pedal. It is very nice to still be able to clip in on winter rides. The inside of the boot is just as nice as the exterior of the boot. Inside the boot is almost a second riding shoe. The shoe is nicely lined with a soft fur lining which is very comfortable… To tighten the shoe is a cinch lace, so pretty much pull the laces and slide the cinch-lock down and bobs your uncle. Under the shoe is a thick insole to prevent any cold from coming up through the cleats. On our last ride when the temperatures were -18C ish, my feet were fine, almost sweating, and just wearing smart wool socks. At the end of the day, the boots are costly, MSRP 325$, but if you plan on doing some winter riding these are more than perfect. If you can find something cheaper than that and in your size pick them up for sure. My Shimano shoe size (45) matched exactly the same as the boot, and I have a little room to spare if I did want to put a larger sock on. Would you buy this Product again: Yes, hopefully I wont have to though, cause they are pricey. Positives: Warm, comfy, SPD compatible, pretty much everything.